I stumbled across "The Position Light" bog earlier this morning and was amazed at all of the information it contains regarding all aspects of railroad signalling. I was searching for locking devices on CTC panels and a picture of Amtrak's THORN Tower appeared in the images page. Here's a link to the blog post: http://position-light.blogspot.com/2011/12/amtrak-thorn-interlocking.html. There's an incredible wealth of information in this post on the operations of THORN Tower along with a large number of photos and diagrams. 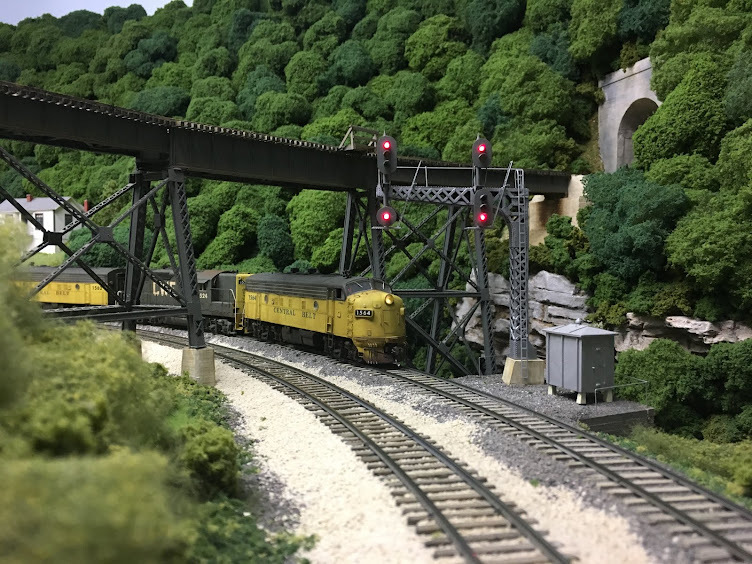 And the home page for the blog is now listed in the Great Railroad Modeling Sites panel on the right of this blog, too. Absolutely great stuff! For those of you who have interest at all in railroad signals, spend a little time on this blog. As each new group of signals is installed and new blocks are wired, I have to go back and change the spreadsheets for the signal input for the previously installed signals. The last signal along the line before an unsignaled section of track is always set to Red over Yellow, or restrictive. Once additional signals are installed, the aspects for this last signal need to be changed to reflect the new configuration of blocks and signals. Other signal inputs also have to be changed to reflect the new configuration. During the last operating session, I asked the crews to report any aspects that weren't displaying what was observed in the field. Due to the recent installation of the signals and blocks at the west end of Nelsonville, I had changed a number of inputs to various signals and wanted to confirm whether or not they were working correctly. As Robby Vaughn brought COXE 532 down the mountain from Summit Springs to Nelsonville, he encountered a Stop signal at BA Cabin. Train NMMT-5 was on the main clear of the turnout which was lined for the yard. Robby should have had a Red over Yellow, or Restricting, giving him permission into the yard. The photo below shows the approximate location of NMMT-5 when Robby approached BA Cabin. It quickly became apparent that the locomotive on NMMT-5 had run into the block that included the turnout to the yard from the main (far left side of the picture above). 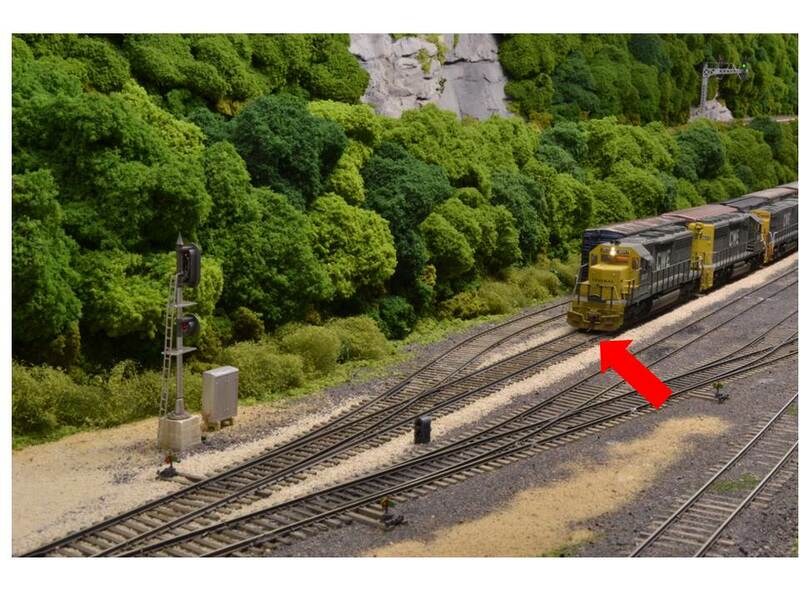 Of course, the engineer on NMMT-5 was none other than the infamous Smokey Doll who just happened to have spent his entire career on the SOU and NS. There was no convincing him that he had overshot the signal. Which, of course, he hadn't. The problem was the position of the signal relative to the block. In the picture below, engine 3017 is just short of the start of the next block. The red arrow shows gap between the blocks. As I don't want to place the gap for the block anywhere in the turnout to the siding before the signal, I need to move the signal. And in order to position the signal head to the right of the track it controls, I'll have to build a signal bridge for this location and place it to the right of the siding where indicated by the arrow in the photo below. The good news is that I can use the current signal at the east end of Nelsonville to control the westbound entrance to the yard and the junction with the Dry Fork Branch. The bad news is that I need to build another signal bridge. Fortunately, I have a supply of signal bridges on hand and the need to build one for this location has provided the inspiration to build the one for the east end of Nelsonville that will control eastbound movements on the main and the Dry Creek Branch. And that, in turn, has provided the inspiration to build the signal controlling the entrance to the main from the Dry Creek Branch. With any luck, we'll have the eastern half of the railroad signaled in the not too distant future. It was about mid-way through the last operating session when I noticed that the rascals had showed up. As I walked into the railroad room from the crew lounge, I spotted an odd sight at the end of the west staging yard. It appeared that someone had set up a new spur complete with a building and a car spotted at it. A closer observation revealed what you see in the photo below. The infamous K&LE horse car had arrived on the CWE and was spotted at a to-be-named industry. The horse car is the work of the illustrious John Miller and he was the one who found the "building" back in the workshop. Before the session started, we had talked briefly about the whereabouts of the horse car. When last seen, it was headed westbound on the CSAO of Deb and Matt Snell. It has also been spotted on the FPS and the DP in the recent past.